If I told you that reading this post could save you from a future acting disaster, would it not the best free acting lesson ever? I’ll never forget a production I saw of John Patrick Shanley’s Pulitzer Prize and Tony Award winning play Doubt at a large and well-respected regional theatre. If you don’t know the story of the play, in a nut shell a Bronx school principal Sister Aloysius suspects teacher Father Flynn of “improper relations” with one of the male students. There’s an important scene between these two where Father Flynn goes to convince her of his innocence and she instructs him to request a transfer from the parish. At the end of the play (spoiler alert! ), he ultimately gets blackmailed into resigning. Anticipating and playing the outcome of the scene was especially problematic for this play in particular because Father Flynn came off immediately as guilty–meaning there was no doubt in the audience’s mind (yeah, that’s the title)–meaning there was no play. It doesn’t matter if you have laid out your intentions, found all the beats or even created a really solid character if you play the end of the scene. What would have happened if Flynn had come into the scene expecting success in winning her over? What if he was 100 percent committed to getting Sister Aloysius to believe he was innocent? How much more of a scene would there have been? And if he had never given up? There might have actually been a play. Talk about letdown. Not only is Shanley a favorite playwright of mine, but I was fortunate enough to have seen Brían O’Byrne play Flynn on Broadway. We’ve all been disappointed as audience members for a variety of reasons, but the big silver lining of these moments as actors and teachers is that we get to learn from them. So what’s an actor to do? 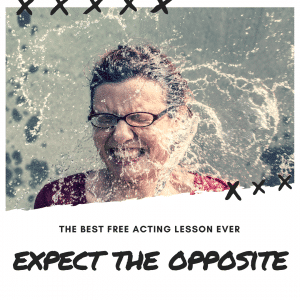 Here’s the best free acting lesson ever: Expect the opposite. If you are playing a scene where you’re supposed to walk in on the love of your life kissing someone else, you’d better react, right? If you prepare to enter the scene with the emotional devastation that’s about to occur you’re dead in the water. What if you prepare to find a beautiful candlelight dinner where your love was finally going to propose? When you expect the opposite, you will not only help set yourself up for an honest reaction, but you’ll give your character somewhere to go. This may seem obvious, but the mistake is really understandable. After hours of work on a scene, of diving deep into the emotional wreckage, building an epic backstory, working with sense memory of a love who broke your heart, etc, expecting the opposite can easily get forgotten because you got so focused the emotional circumstances of the play. But if you don’t anticipate, you get to take the fall. You have somewhere to go. Too often actors play the end of the scene (or the story) before they get there and this robs you (and the audience) of arc. Have you ever fallen into this trap? Or ever had a huge acting lesson come from letdown? Share your questions / comments / stories below.